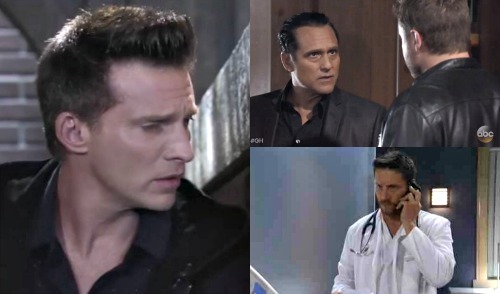 General Hospital (GH) spoilers tease that Patient Six (Steve Burton) has more problems in his future. He worked hard to make it back to Port Charles, but nothing’s quite the same. Since the clues point to Burton’s character being the real Jason, let’s consider what he can do to get his life back. Here are four obstacles classic Jason has to overcome. Dr. Klein (Gene Farber) will pop up again on next week’s new GH epsiodes, October 23-27, so it seems Patient Six isn’t done with the clinic drama. He needs to find a way to put all that to rest. Patient Six is going to have enough on his plate thanks to the twin situation. Perhaps classic Jason can seek help and finally get Dr. Klein’s violent team off his back. Disbelief will be another big obstacle for Patient Six. Billy Miller’s version is accepted around town, so who’s going to buy that P6 is Jason? Once Franco (Roger Howarth) comes forward with the twin news, people will likely assume that Patient Six is Drew. Burton’s character will insist that they’ve got it all wrong, but there’ll definitely be doubts about his claims. That brings us to the next obstacle on the list. Since classic Jason will face disbelief from his friends and family, he’ll need to prove he’s who he says he is. How’s he supposed to pull that off? 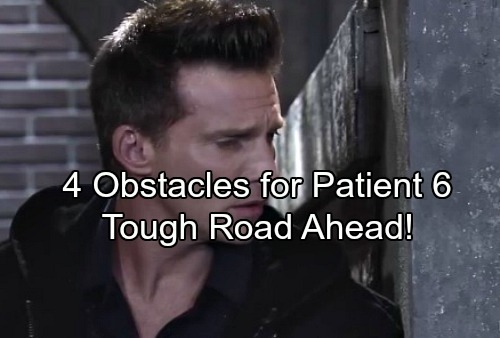 General Hospital spoilers suggest that Patient Six will do whatever he can to dig up evidence, but he’s fighting an uphill battle. Burton’s GH character will have to put plenty of work into it. Time is obviously a major factor here. If classic Jason’s side of the story is legit, he’s been gone for five long years. He’s missed birthdays, crucial milestones, disasters and even Morgan’s (Bryan Craig) death. It could be a real struggle for classic Jason to reconnect in PC. Absence can make the heart grow fonder sometimes, but other times it just creates distance and regrets. Patient Six can’t get those years back, but he has to make the most of the present. Do you think classic Jason can tackle all these hurdles? Will he get his old life back or be forced to create a new one? We’ll give you updates as other General Hospital details emerge. Stay tuned to ABC’s GH and don’t forget to check CDL often for the latest General Hospital spoilers, updates and news.